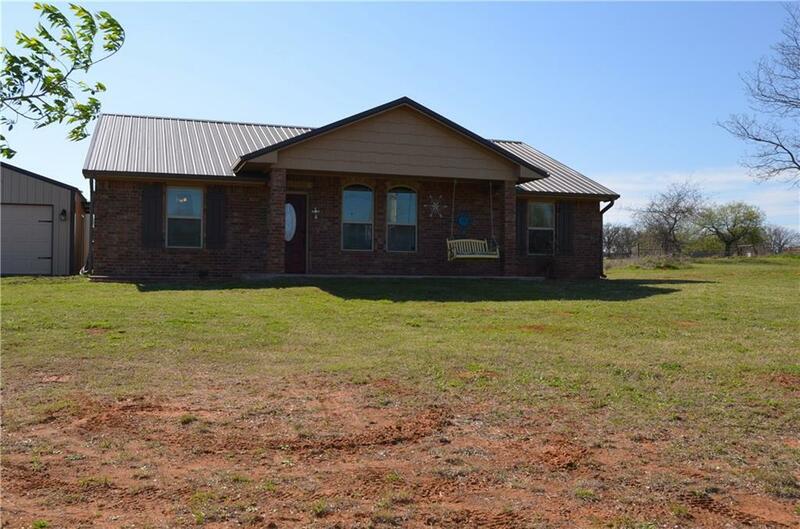 Beautiful home on one acre, large master bedroom with walk-in closet , double vanities with lots of storage. shower/tub combo . Stained concrete floors throughout . Large open floor plan with large granite top island with seating. stainless steel appliances, free standing electric range/oven, dishwasher, garbage disposal, microwave. large granite composite sink with pullout sprayer faucet with soap dispenser. Brick fireplace with gas logs. Large covered front porch and back porch. Garage is next to the home with covered access to the back door. Nice size dinning area. The other two bedrooms are nice size with nice closets. They are on the opposite side of the house from the master bedroom, the hallway has a linen closet. There is a full bathroom with a shower/tub combo off the hall between the bedrooms. Great floor plan. The home has a metal roof for a long life. The home has guttering already on for you. Bronze fixtures throughout. Nice laundry room off the kitchen.